Two days before the start of our Food Stamp Challenge, my husband and I went grocery shopping. The idea is to gain empathy and understanding of the challenge of living on the average food stamp allotment. So in Maryland, that amount is about $30 a week. 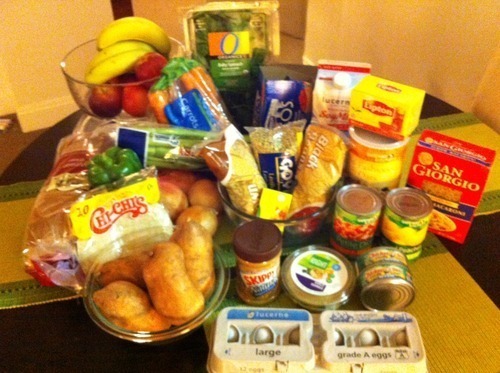 For two adults, we shopped for $60 worth of groceries to feed us both for a week. I had planned out an Excel spreadsheet of meals that I thought could feed us, but I really didn’t know if I would be within our budget. My husband prepared an additional Excel spreadsheet to track our expenses in the grocery store. I went online and downloaded digital coupons to my Safeway card. I printed my shopping list and the week’s menu, grabbed our reusable bags, and we were off. The very first item on our list threw us for a loop: spinach. I had already given up getting our normal organic spinach. I picked up the bag of conventional spinach but realized I would need to buy two bags to meet our needs. But two bags would cost more than the big container of organic spinach! But putting $6.99 of spinach into our cart meant we were left with only $53.01. In it went. While in the produce section, we priced a few things that didn’t make it into our cart. You see, we subscribe to a weekly CSA and weren’t willing to let our share go to rot for a week. So instead Laura Flamm from Maryland Hunger Solutions advised me to price the value of the CSA items we would be using and subtract that amount from our budget. But I also had some insider knowledge that was going to make that produce purchase less of a hit. I happen to know that anyone with SNAP benefits can shop at the Baltimore Farmers’ Market and Bazaar and get $10 in Bonus Bucks if they spend at least $10 of their SNAP allotment at the market. So theoretically I could have purchased my CSA share at the farmers’ market and used Bonus Bucks to supplement my SNAP dollars. My butternut squash, kale, beets, and cherry tomatoes would have cost about $12, which means I could have bought them for $6 by using Bonus Bucks. So that dropped our grocery store budget to $54. Stay tuned as I post our meals and the daily cost of what we eat and drink and the challenges we face. You’re lucky your state allows you to shop at the farmer’s market and get those bonus bucks. If only it was like that everywhere. You are very right! Unfortunately the technology of the EBT card that makes purchases in stores much easier makes it harder to use at farmers’ markets or farm stands. Several area markets have started to do tokens in the past few years, and there is one market (in Michigan, I think) experimenting with getting farmers technology to be able to swipe cards. Right now it’s really expensive for each farmer to have a machine and services like the Square (that can be attached to a smart phone) are not allowed to accept EBT cards by federal law. Hopefully access at farmers’ markets (and bonus bucks) will become nationwide! I can only hope! That would be such a fantastic benefit to so many families!